Emachine was a company that made inexpensive computers; it was purchased by Gateway in 2004. Generic inexpensive computers are also referred to as emachines. There have been many problems with emachine computers. Since computer profit margins are small, many emachine manufacturers purchase lower quality parts, which have a tendency to fail prematurely. The majority of these failures seem to be isolated to power supply failures and motherboard failures. 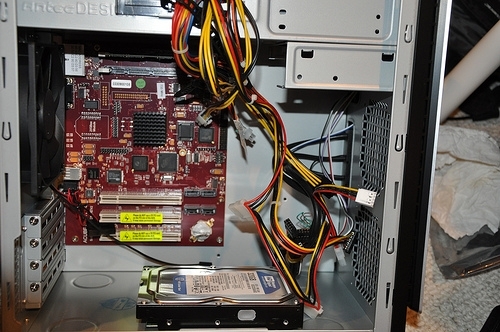 The power supply provides power to everything inside a computer as well as devices plugged into USB (universal serial bus) ports. This makes it difficult to tell whether the power supply is going bad or something is drawing too much current, causing the power supply to shut down. Failing power supplies can keep your computer from turning on, shutting down immediately after turning it on, turning off after heating up and rebooting randomly. Since motherboard failure can display the same symptoms, it is often very difficult to determine whether it is a failing power supply or a failing motherboard. Power supplies are less expensive and easier to replace, so it makes sense to replace the power supply first if you are not sure. Power supplies are notorious for overheating; the first thing you should do before replacing your power supply is to clean your computer fans and vents. Also, make sure all of your cooling fans are operational and you have proper clearance around your computer. If you are considering replacing your power supply, you should consider replacing it with a 400 watt supply or larger. You can purchase these online for less than $40 (see resources). Just make sure it is the correct type and that the new power supply will fit in your computer case. Power supplies are easy to replace and can be done by anyone with a Phillips screwdriver and a modicum of skill. Just unplug your computer, remove the side, unplug the wires from your power supply to the motherboard and drives, unscrew the retaining screws, remove the bad power supply, put in your new power supply, and plug in the wires. Before replacing your power supply, contact the manufacturer to see if you can get it replaced for free.